PianoPushPlay! 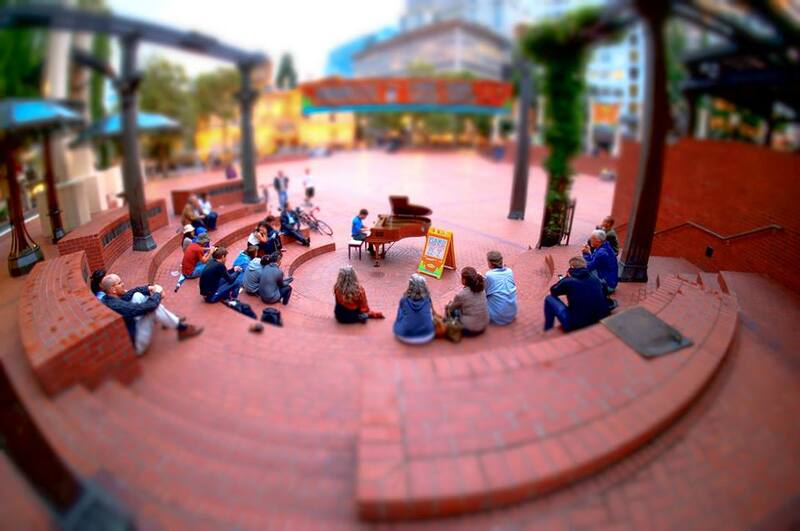 put a piano in Portland’s Pioneer Courthouse Square. by BRETT CAMPBELL. Photos by Benji Vurong. “Do you ever let the pianos outside”? Megan McGeorge asked the employee at Sherman Clay/Moe’s Pianos in Portland’s Pearl District. The Portland State University piano student was envious. The previous summer, just one block away on 13th and Burnside, she had seen a cellist playing for passersby and she longed for a more portable instrument so she could do the same. The Sherman Clay staff agreed to mount one of its “starter” pianos on a dolly, and that’s how McGeorge and some friends wound up pushing a piano down 13th avenue last summer, performing several times while walkers, drivers, bicyclers, even office workers in nearby buildings looked on in surprise and delight. 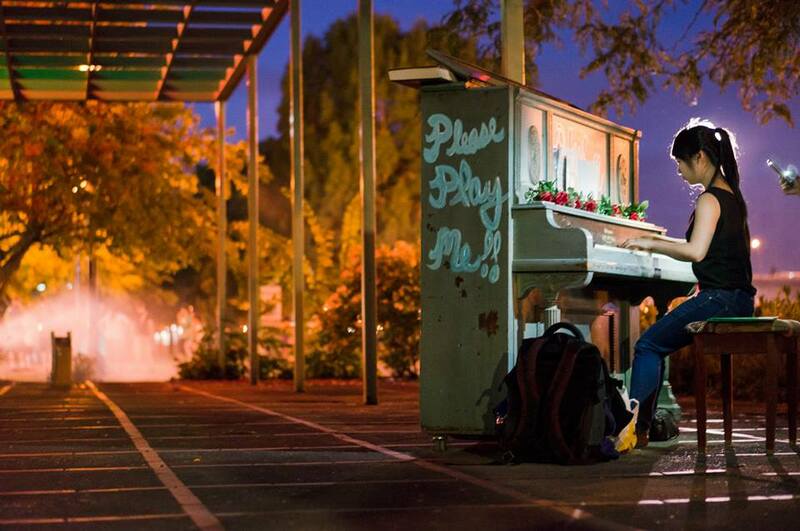 Eventually, it put pianos at four locations last summer. PianoPushPlay! was born. The project blossomed this summer. Beginning last month, McGeorge and friends placed pianos provided by the nonprofit Snowman Foundation at several different pedestrian-popular downtown Portland spots, including Waterfront Park, Pioneer Courthouse Square, at the Rose Festival and Saturday Market, and that original location at 13th and Burnside, for a couple of weeks. (A tarp is provided to protect them in the unlikely event of rain.) Though Sherman Clay has closed, its employees have opened a new store, Portland Piano Company, which this summer sponsored much of the needed tuning for the installation and provided a repair technician for the project’s sole grand piano. The project certainly enlivened the popular shopping area, and maybe drew some attention to the piano store. But McGeorge would soon learn that providing Portlanders a passel of public pianos would have far more profound effects. PPP is returning to the Portland Art Museum (where a piano has drawn plenty of players and attention for the past couple weeks) this Friday at 7 pm. But until the instruments leave at summer’s end, anyone can play any of the pianos at any time, and many have, day and night. And if McGeorge has her way, PianoPushPlay! will soon be bringing the gift of music to many more Portlanders who might otherwise never receive it. 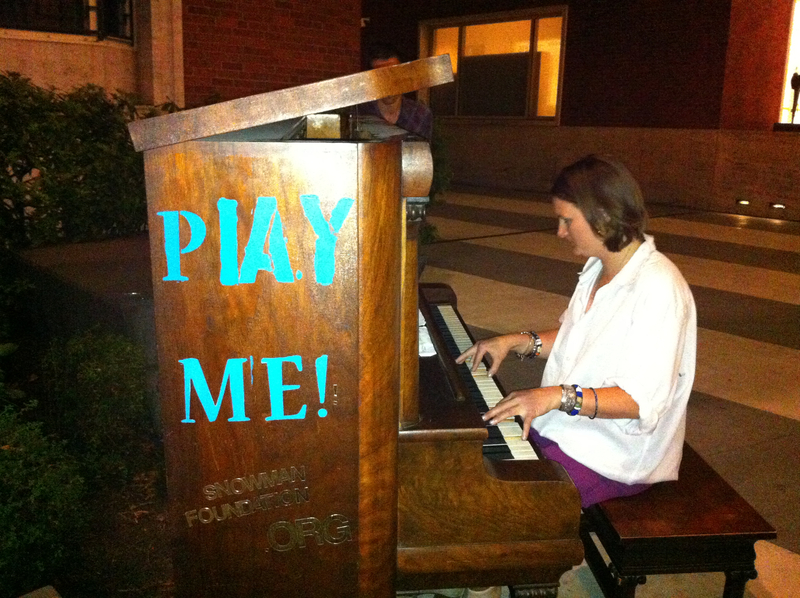 McGeorge, now 29, had seen pianos outdoors before, on a visit to New York City, where artist Luke Jerram’s “Play Me, I’m Yours” project (which has been touring since 2008) used pianos to encourage “the public to engage with, activate and take ownership of their urban environment.” But McGeorge was less interested in urban engagement or art for art’s sake than in “guerrilla advertising for classical music,” she told ArtsWatch. Disillusioned by classical music’s competitive culture, narrow categories (e.g. orchestral musician, musical theater performer, studio player) and limited performance and employment opportunities, McGeorge briefly turned away from classical music after obtaining her bachelor’s degree from PSU in 2007, instead writing and performing her own songs under the name Leo, which she continues. It wasn’t just listeners who could benefit from such spontaneous exposure to hands-on music making. 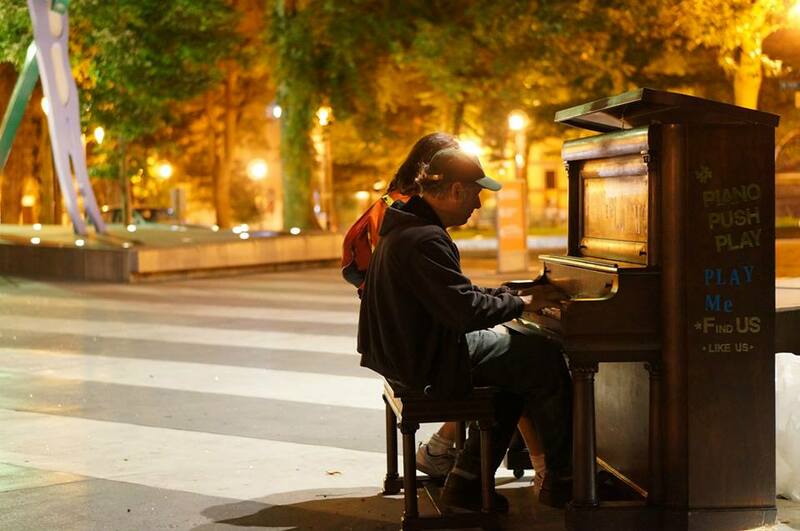 McGeorge’s fellow PSU students “were studying music but they weren’t playing for people,” she lamented, including a few who volunteered to play the street pianos last summer — but pulled out, afraid that passersby would hear every imperfection in their playing. The classical students’ attitude contrasted sharply with her friends in pop music bands who lacked formal training but were eager to play for anyone who’d listen. “Students in music school could learn from people outside of music school,” McGeorge says. “They’ll say, ‘oh, there’s a gig tomorrow, I want to do it,’ instead of feeling like ‘I need weeks to prepare for a show.’ Not to say you shouldn’t be prepared, but I’m sure any pianist has three songs they can perform and impress people with. As it turned out, PPP hasn’t lacked for skilled pianists. “They keep coming out of the woodwork!” she marvels. She found several at Classical Revolution PDX last month, and members of that indie classical organization have enthusiastically embraced the project. Portland Piano put McGeorge in touch with the Snowman Foundation, the valuable organization founded by nationally renowned Portland composer and pianist Michael Allen Harrison that’s devoted to bringing music to children by facilitating instrument donation drives, free lessons, performances, grants and more. It offered McGeorge more donated pianos from its warehouse than she could handle this year. Next summer, she’d like to have enough time, pianists and resources to accommodate the foundation’s offer of 20 pianos. That would fit McGeorge’s ambitions for PPP. “I want people to have access to pianos all the time,” she says, “especially for pianists who aren’t students who have the access code [to a university practice room] and can’t afford one in their homes. There are plenty of pianos out there not being used and played. I need to get more resources so I can take those pianos and put them in places where people are going to play them, in every musical style,” not just classical music. As a singer-songwriter, McGeorge knew there was always a shortage of “house” pianos in clubs and bars. An electronic keyboard or Fender Rhodes or other electric piano just can’t produce the magical sound of an acoustic instrument, and having a real piano would attract more local and touring performers to those clubs. So McGeorge hopes to work with piano-less clubs to organize piano-centric concerts there to raise money for annual tuning and upkeep, and raise funds for the next piano donation. “I see the donation of all these pianos to various spaces as giving the access and resources to many pianists/musicians like myself who want to play music for people on the instrument they actually want their music to be heard on — the piano! — be it classical piano music, singer-songwriter stuff, bands, experimental music…whatever,” she says. 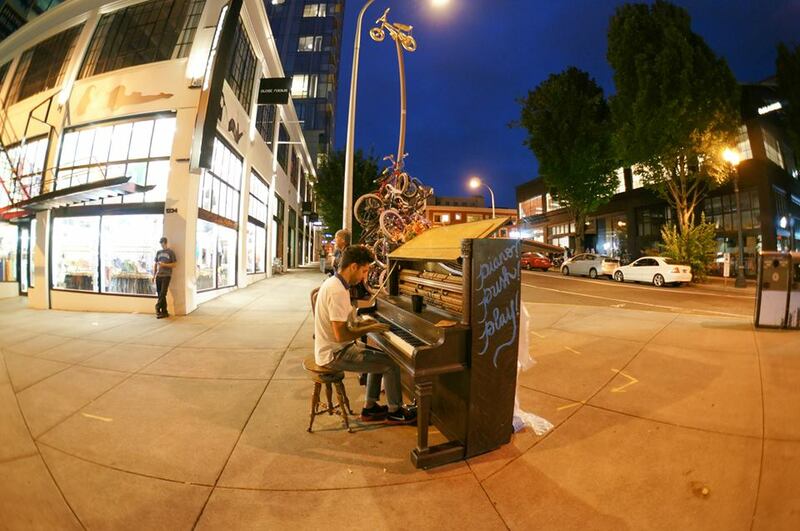 Next, McGeorge wants to expand access to pianos by creating public piano map (and who knows, maybe an app as well) so that anyone who wants to play could find the nearest publicly available piano. Next summer, she intends to increase the number of pianos available to at least ten, including placing some on the east side of the Willamette River. And she aims to move beyond temporarily putting pianos in public places and clubs to donating them — including the original four pianos used in this summer’s public installations — to public institutions like schools, shelters, senior centers and more so that they’ll have a permanent home throughout the year, not just during Portland’s non-rainy summers. “We want to develop a community network,” she says, enlisting venues and other businesses that would sponsor (that is, cover the cost of tuning and moving a donated instrument) a piano, host a public performance using it, then donate it to a community group or school. She’s in touch with organizations such as Southeast Uplift, Outside In and New Avenues for Youth that serve homeless/at risk youth, and has talked to Portland State University prof and acclaimed jazz pianist and composer Darrell Grant about involving the school in her efforts. McGeorge cooking up a Kickstarter campaign, and anyone interested in supporting her efforts can do so now through this donation site. Watch Portland Performs for Piano! Push Play! on PBS. See more from Arts and Life.